This category has two sections. The first lists items from Alan Class’ private collection. The second lists our regular stock. More information about Alan can be found on the Extras page and information about content can found in the Alan Class Guide. 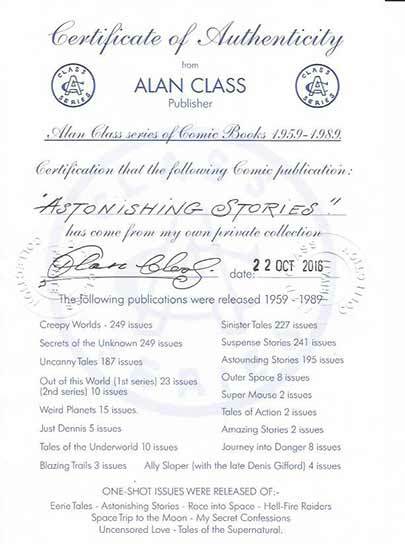 Alan Class has generously announced that he will sign (either with a plain autograph or a personalised dedication) any comic/set purchased from the Alan Class Private Collection. This is in addition to the certificate already included. Please let us know if you wish this free-of-charge extra when buying any of the issues listed below in green. Please note that this will entail a short shipping delay while we contact Alan Class to provide this. Each of these unique items from the personal archive of Alan Class comprises the four lead printing plates used in the original comics’ colour printing, a copy of the comic printed with these plates and a signed certificate of authenticity signed by Alan Class himself. These are packaged in a special protective case. 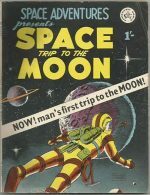 Several sets (as noted) have additional historical artefacts such as colour proofs, interior page plates, printers’ photostats, additional comics reprinted later in the series, original American comic featured etc. Some sets also feature handwritten anecdotes on separate cards with Alan Class’s reminiscences about a particular comic. As Class collectors will be aware, the same plates and covers were used for several issues in the series, and we include wherever possible as many examples of this in each set to present the publishing history of the use of the printing plates. Each set additionally comes with a colour information sheet showing a picture of Alan Class with his comics (while stocks last). Please be aware that if ordering for postage, these weigh a lot and postage will be expensive, particularly outside the UK. 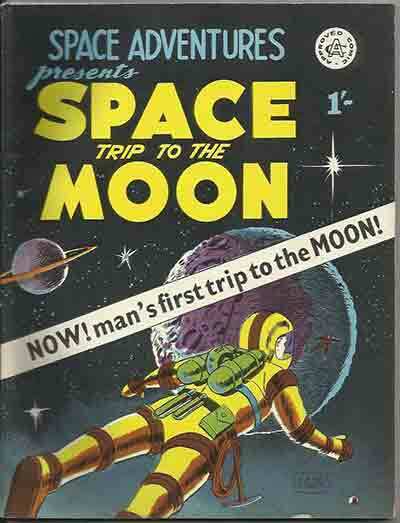 NN (#1) £44 4 cover colour plates plus 1 pre-decimal comic (VG/FN) plus 1 post-decimal comic (Astounding #190) plus 2 interior plates and certificate. 2 Ditko stories. 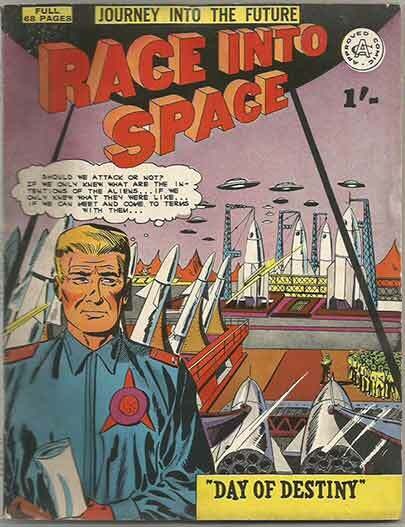 4 £57 4 cover colour plates plus 1 pre-decimal comic (GD) plus 2 post-decimal comics (#98 & ‘S’) and certificate. 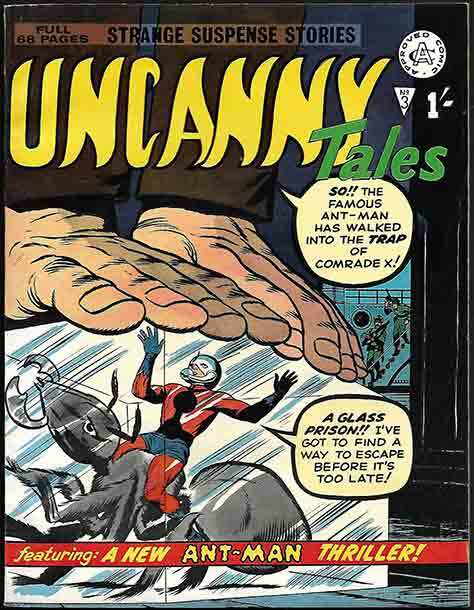 Ditko cover and 3 stories 1 Kirby story. 7 £23 4 cover colour plates plus 1 pre-decimal comic (GD) plus 2 post-decinal comics (#136 & #167) and certificate. 8 £32 4 cover colour plates plus 1 pre-decimal comic (VG+) plus 3 post-decimal comics (#104, #137 & #168) and certificate. 9 £30 4 cover colour plates plus 1 pre-decimal comic (FN) plus 1 post-decimal comic (#192) and certificate. 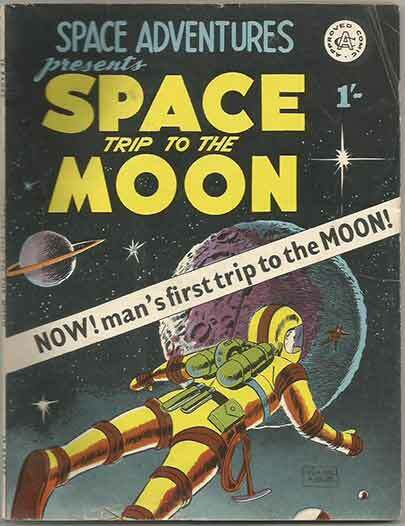 15 £22 4 cover colour plates plus 1 pre-decimal comic (VF-) plus 2 post-decimal comics (#114 & #143) and certificate. 16 £23 4 cover colour plates plus 1 pre-decimal comic (FN) plus 2 post-decimal comics (#119 & #151) plus printer’s instructions and cover proof and certificate. 18 £21 4 cover colour plates plus earliest pre-decimal comic (FN) plus later pre-decimal comic (#79) plus 1 post-decimal comic (#175) and certificate. 1 Williamson story. 29 £39 4 cover colour plates plus 1 pre-decimal comic (FN/VF) plus 1 post-decimal comic (#93) plus 2 interior plates and certificate. 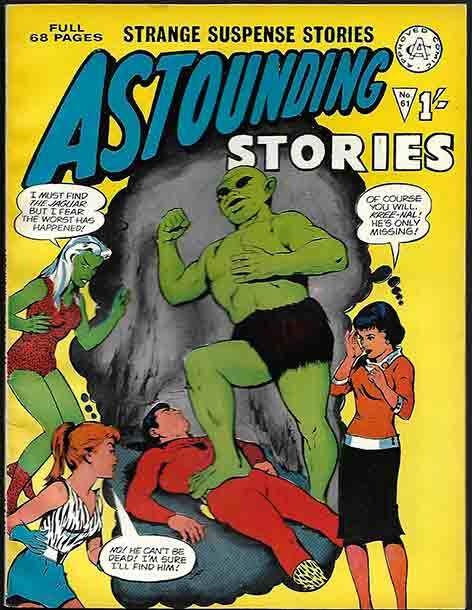 Reprints Giant-Man story from Tales To Astonish #50 inc cover. 34 £28 4 cover colour plates plus 1 pre-decimal comic (FN) plus 3 post-decimal comics (#97, #127 & #157) plus 2 interior plates plus 2 untrimmed cover sheets and certificate. 1 Ditko story. 48 £19 4 cover colour plates plus 1 pre-decimal comic (FN) and certificate. 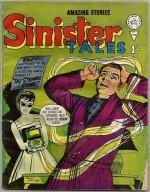 Ditko cover plus 5 Ditko stories. 52 £26 4 cover colour plates plus 1 pre-decimal comic (FN) plus 3 post-decimal comics (#96, #125 & #155) plus 2 interior plates and printer’s instructions and certificate. 1 Kirby story. 66 £34 4 cover colour plates plus 1 pre-decimal comic (VF) and certificate. Reprints Amazing Spider-Man #57 inc cover. 71 £19 4 cover colour plates plus 1 pre-decimal comic (VF) plus printer’s colour cover proof and certificate. 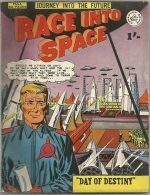 94 £19 4 cover colour plates plus 2 interior plates plus earliest post-decimal comic (FA) with publisher’s annotation, and 1 later post-decimal comic (#159) and certificate. 121 £17 4 cover colour plates plus publisher’s notes to printer about changes to different editions plus earliest post-decimal comic (GD) and 1 later post-decimal comic (#153) and certificate. 132 £16 4 cover colour plates plus earliest post-decimal comic (FA/GD) plus 1 later post-decimal comic (#163) and certificate. 1 Ditko story. 2 £27 4 cover colour plates and 2 interior plates plus pre-decimal comic (VF) and certificate. 2 £26 4 cover colour plates plus 1 pre decimal comic (FN/VF), plus 2 interior plates and certificate. 3 £25 4 cover colour plates plus 1 pre decimal comic (FN), plus 2 interior plates and certificate. 1 £61 4 cover colour plates plus 1 pre-decimal comic (FN) and certificate. 2 Ditko stories. 4 £45 4 cover colour plates plus 1 pre-decimal comic (VG) plus 2 printer’s colour cover proofs and certificate. 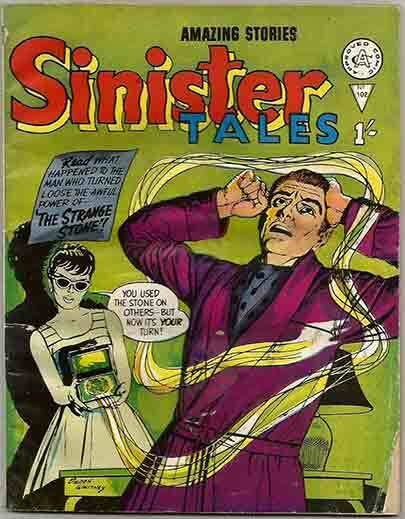 Ditko cover plus 1 story. 13 £15 1 cover colour plate (black) plus 1 pre-decimal comic (VF) and certificate. 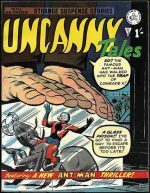 3 Ditko stories. 16 £17 4 cover colour plates plus 1 pre-decimal comic (GD), plus 1 interior plate and certificate. 1 Ditko story, 2 Kirby. 23 £19 4 cover colour plates plus 1 pre-decimal comic (FN), plus 2 interior plates and certificate. 41 £30 4 cover colour plates plus earliest pre-decimal comic (FA) and 1 later pre-decimal comic (#105) plus colour cover proof, 64 black and white interior photostats, 2 interior plates and certificate. 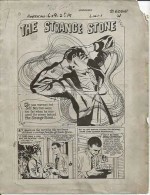 Ditko cover and story. 73 £17 4 cover colour plates plus 2 interior plates plus 1 pre-decimal comic (FN) plus 1 post-decimal comic (#138) and certificate. 1 Ditko & 1 Williamson story. 102 £17 4 cover colour plates plus 1 pre-decimal comic (FN) and certificate. 122 £22 4 cover colour plates plus 1 post decimal comic (VG) and certificate. Reprints Silver Surfer #12 inc cover. 170 £19 4 cover colour plates plus earliest post decimal comic (FN) and later post-decimal comic (#S) plus black and white cover proof and certificate. 1 Ditko story. 6 £20 3 cover colour plates plus 1 cover proof plus 1 pre-decimal comic (FA) andcertificate. 1 Ditko story. 55 £32 4 cover colour plates plus 2 interior plates (inc Thing & Torch splash page) plus 1 pre-decimal comic (VG) & certificate. 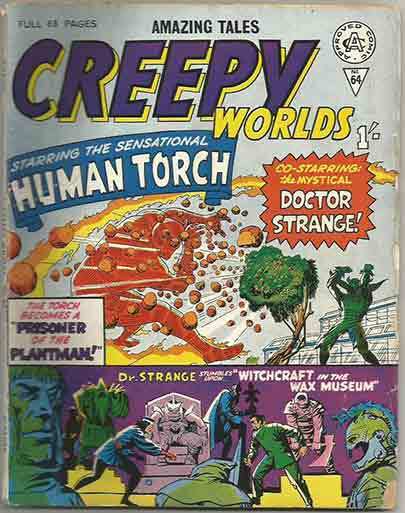 Reprints both Torch/Thing & Dr Strange stories from Strange Tales #134 inc cover. 65 £18 4 cover colour plates plus 1 pre-decimal comic (GD) and 1 post-decimal comic (#179) and certificate. 102 £21 4 cover colour plates plus 1 pre-decimal comic (GD/VG) plus 1 cover colour proof plus 48 b&w interior page proofs and certificate. 154 £16 4 cover colour plates plus earliest post-decimal comics (FA) and later post-decimal comic (#189) and certificate. 203 £15 4 cover colour plates plus 1 post decimal comic (VG) and certificate. 2 Ditko stories. 127 £18 4 cover colour plates plus earliest post-decimal comic (GD) and later post-decimal comic (#198) plus 2 interior plates and certificate. 180 £15 4 cover colour plates (for #25) plus post decimal comic (FA/GD) and certificate. 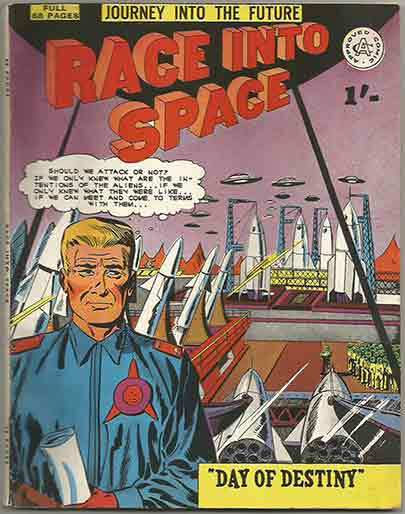 2 Kirby stories plus cover, 4 Ditko stories. 184 £15 4 cover colour plates (for #22), plus post decimal comic (FA/GD) and certificate. 3 Ditko stories, 1 Kirby/Ditko story. 208 £15 4 cover colour plates (for #51), plus post decimal comic (GD) and certificate. 212 £15 4 cover colour plates plus 1 post decimal comic (VG), plus printer’s colour cover proof and certificate. 4 £24 4 cover colour plates plus 1 pre decimal comic (FN), plus 1 interior plate and certificate. 6 £18 4 cover colour plates plus 1 pre decimal comic (FN), plus 1 interior plate and certificate. 7 £19 4 cover colour plates plus 1 pre decimal comic (FN/VF), plus 1 interior plate and certificate. 8 £19 4 cover colour plates plus 1 pre decimal comic (FN/VF), plus 1 interior plate and certificate. 9 £17 4 cover colour plates plus 1 pre decimal comic (VG), plus 1 interior plate and certificate. 10 £16 4 cover colour plates plus 1 pre decimal comic (GD), plus 1 interior plate and certificate. 6 £32 4 cover colour plates plus sequential colour guide plus 1 pre-decimal comic (GD) and 1 post-decimal (#135) and certificate. 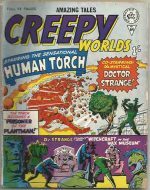 1 Human Torch story, 1 Ditko Dr. 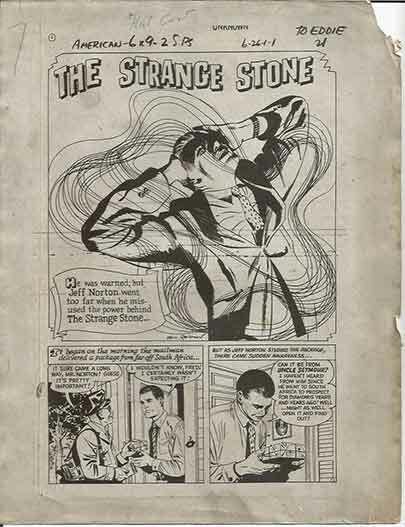 Strange in #6. 128 £16 4 cover colour plates, plus earliest post-decimal comic (GD) and later post-decimal comic (#158) and certificate. 129 £15 4 cover colour plates, plus post decimal comic (GD/VG) and certificate. File copies from the Private Collection of the publisher. Each item comes with a signed certificate of authenticity hand signed by Alan Class himself.